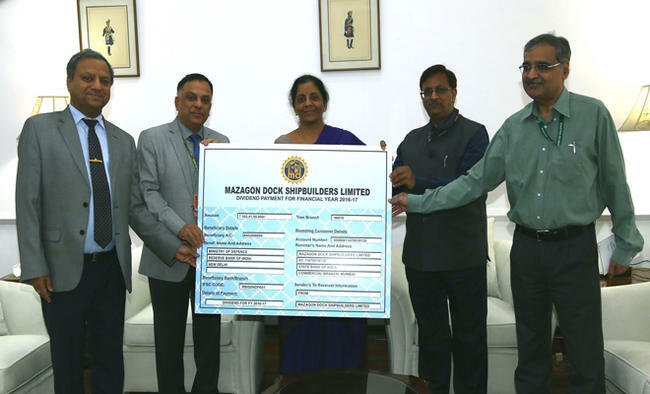 New Delhi: Mazagon Dock Shipbuilders Limited, the country’s premier Defence Shipyard has declared a dividend of Rs. 165.41 crore at the rate of 66.43 percent on equity share capital for financial year 2016-17. The cheque for the amount was handed over to the Raksha Mantri Smt. Nirmala Sitharaman on 28 February 2018 by the Chairman and Managing Director, Cmde (Retd) Rakesh Anand in presence of Addl. Secretary (Defence Production) Shri Sanjiv Mittal, JS (Naval System) Shri Vijayendra and Director (Submarine & Heavy Engineering) Capt Rajiv Lath.The Company recorded a turnover (VOP) of Rs. 3523.67 crore with profit after tax of Rs.525.12 crore in FY 2016-17.